Doc Pomus was the most unlikely of rock & roll icons. Paralyzed with polio as a child, Brooklyn-born Jerome Felder – the brother of New York attorney Raoul Felder, reinvented himself first as a blues singer, renaming himself Doc Pomus, then as a songwriter, creating some of the greatest hits of the early rock and roll era: "Save the Last Dance for Me," "This Magic Moment," "A Teenager in Love," "Viva Las Vegas," and a thousand others. Doc used crutches and a wheelchair. He lived life fully, if not always happily or easily. A.K.A. 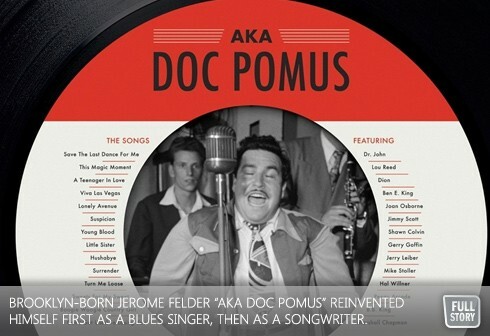 DOC POMUS brings to life Doc's joyous, heartbreaking, romantic, and extraordinarily eventful journey. Packed with incomparable music and rare archival imagery, it features a cast which includes Dr. John, Ben E. King, Joan Osborne, Shawn Colvin, Dion, Jerry Leiber and Mike Stoller, and B.B. King. As well, Doc's journals are read in the film by his close friend, Lou Reed. Doc Pomus is a member of the Rock and Roll Hall of Fame, and the first white person inducted to The Rhythm and Blues Hall Of Fame. His story is one of triumph over adversity. Now, a new award-winning film called “AKA Doc Pomus” showcasing Felder’s remarkable life and career is playing at Toronto’s Cineplex Varsity and Empress Walk from December 6th to 12th, following outstanding runs in New York and Los Angeles. The film was made possible by Toronto charity, Canadian Jewish Media Education Foundation, and made possible by the support of UJA donors. The purpose of the CJMEF is to educate the general public on the accomplishments of Jews in society.